Joomla Virtuemart Product Compare : This splendid extension allows admin to provide the feature of "add to compare" at Virtuemart store end. The concept of checkbox has been provided to select the products and list them for comparison. Joomla Virtuemart Product Compare - This splendid extension allows admin to provide the feature of "add to compare" at Virtuemart store end. The concept of checkbox has been provided to select the products and list them for comparison. The option of comparison is available in the end of product category, product detail page and the front page of Virtuemart store. Products can be compared by selecting the “Add to Compare” checkbox. Option to set the maximum number of products to be compared is available. User/customer can delete their Compare Products into a cart. Option to set the position and colour of compare is available. The functionality of product comparison can be category specific based on the admin configuration. 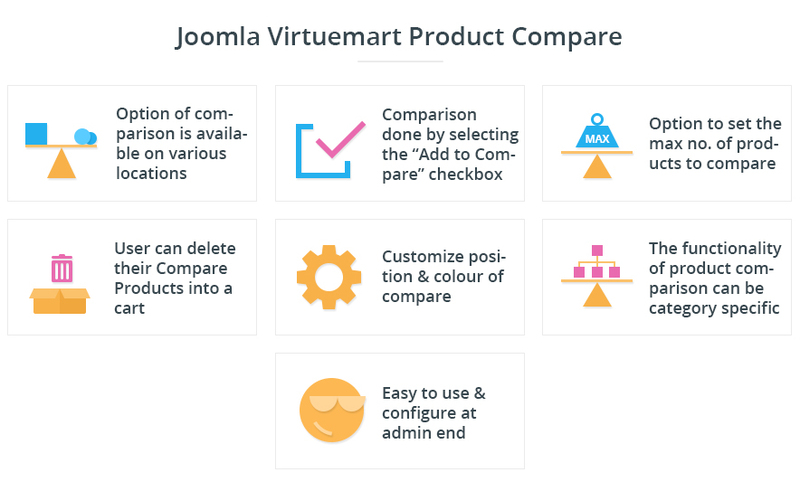 Did you buy Joomla Virtuemart Product Compare? 1) Functionality- This extension does everything is described. 2) Ease of use- No problem during installation and use. 3) Support- Support has been very fast and competent! 4) Documentation- You'll find what you need in docs. 5) Value for money- Cheap for what you get! 1) Functionality - Probably, this is the best extension available for product comparison. I really like it. 2) Ease of use - The simplicity of this extension really helps me to compare different products easily. I want to purchase your Product Compare, but I doubt regarding product categories. Can I set compare for some of the categories product only? Yes, you can set product comparison on some of the categories only. Does the plugin work for Guest users of the Site? Yes, the plugin works for both guests as well as registered users of the Site. Can the buyer check the products he/she have set for comparison at any moment? We have shown the comparison products in a small slider view that you place on your Site pages as required. Can we change the position of this compare view? Yes, we have provided the option in the plugin configuration for the position. I have Installed the plugin on my site but I am unable to use it. What can I do? In that case, you can simply create a ticket on our support so that we can assist you in a better manner.